On a bit of a roll today as it's a rainy Sunday here in NZ and what better to do on a rainy day than show off some of your collection. 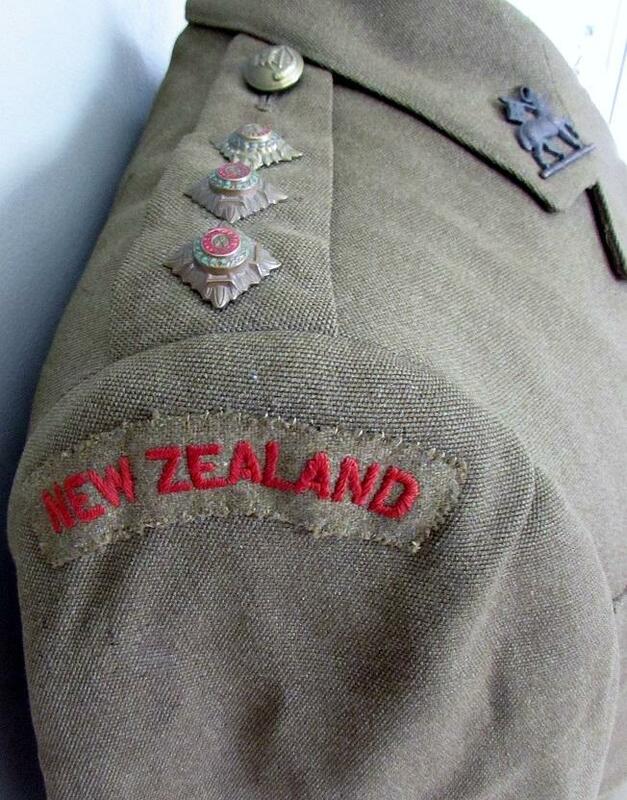 Been hitting the Commonwealth - Kiwi/Aussie topic a bit today so thought I would change it up a bit and show a BD blouse that might be of interest to UK uniform collectors. Here is my converted 1940 pattern Battle Dress Blouse. The collar has been converted to an open front and all the buttons changed for leather. The collar conversion has been done rather professionally by adding extra material to the collar so the once high collar now lays nice and flat. The top two button holes have also been sewn up the extra material also nicely covers the evidence of these up too. 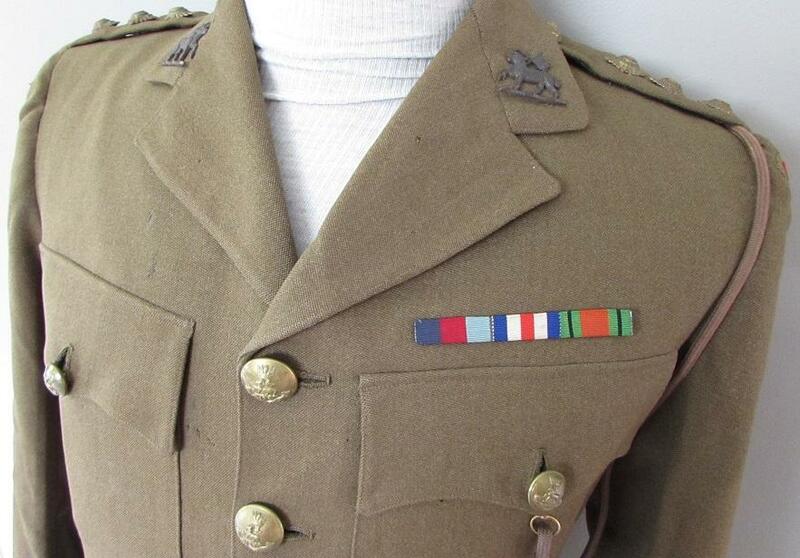 This particular uniform was originally owned by Winston Malbourne CRAIG . Winston was born in Australia in 1913 and at some point moved to NZ. In June 1940 he enlisted in the NZ Army. His occupation on enlistment was carpenter and this might be why he was transferred in July 1940 to the 15th Forestry Company, NZ Engineers. On 27 August 1940 he embarked for overseas service, with the rest of the Forestry Company, on board the ship Empress of Japan. They trans-shipped at Bombay, India onto SS Ocades an set sail for the United Kingdom arriving there in November 1940. In May 1943 he was selected to attend a Officer Cadet Training Unit. In September 1943 he was married to Irene BONNER at the parish church Woking, Surrey and on the 15 September 1943 was transferred to the British Army (Pioneer Corps). This transfer was confirmed 7 January 1944. His service with the British Army was from January 1944 till July 1946, he then seems to have returned to NZ and lived here for the rest of his life, he died in 1989. As well as the Battle Dress Blouse I have also been lucky enough to pick up his Service Dress tunic and trousers. 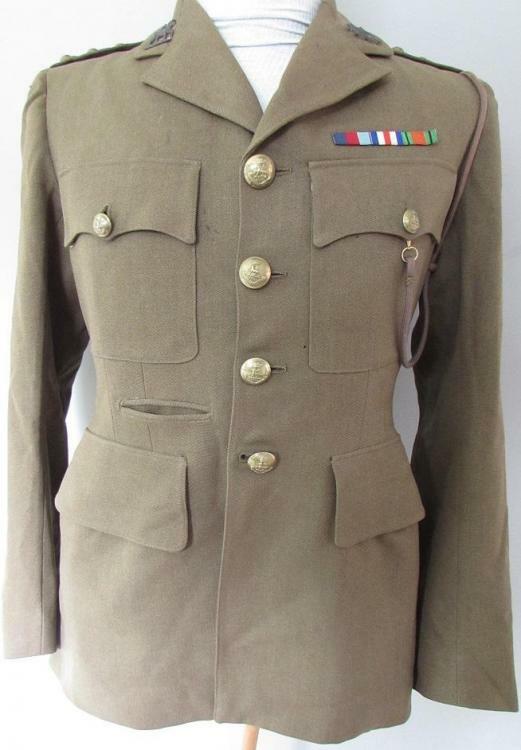 The style of Service dress is a little different as it is an example of the Austerity Pattern introduced in 1942 in an effort to conserve materials and production time. The new Austerity pattern tunics no longer had box pleated breast pockets, though it still has the scalloped pocket flaps, and the lower pockets were now of the internal type just with a flap instead of the previous patch pocket style. The sleeves were plain. This new pattern tunic was introduced under “Army Council Instruction (ACI) 501, dated March 7th 1942”. By early 1945, the situation had improved and under “ACI 340” military tailors were once again allowed to supply tunics of the pre 1942 pattern, but only to newly commisioned Officers or to those who truly needed a new replacement tunic due to their old one being worn out. The ribbons are for the 1939-45 Star, France & Germany Star and Defence Medal. The collar badges are for the Queen’s Royal Regiment. The collar badges are the standard bronze for officers and appear to be stamped rather than cast. The Queen’s Royal Regiment can trace its beginnings back to 1661 when it was raised specifically to garrison the recent acquisition of Tangier. After a number of amalgamations, the last being in 1992, the lineage of the Queen’s Royal Regiment is continued by the Princess of Wale’s Royal Regiment (Queen’s & Royal Hampshire’s). Sorry, but I'm a little confused. Your man served with the Pioneer Corps, but neither of the uniforms you pictured are badged to that Corps. The BD has Somerset Light Infantry badges [214 Bde, 43 Inf Div], and the SD has collar badges from the Queen's. Being particularly ignorant, please can you explain to me why he would wear New Zealand sub-titles if he had transferred to the British Army?